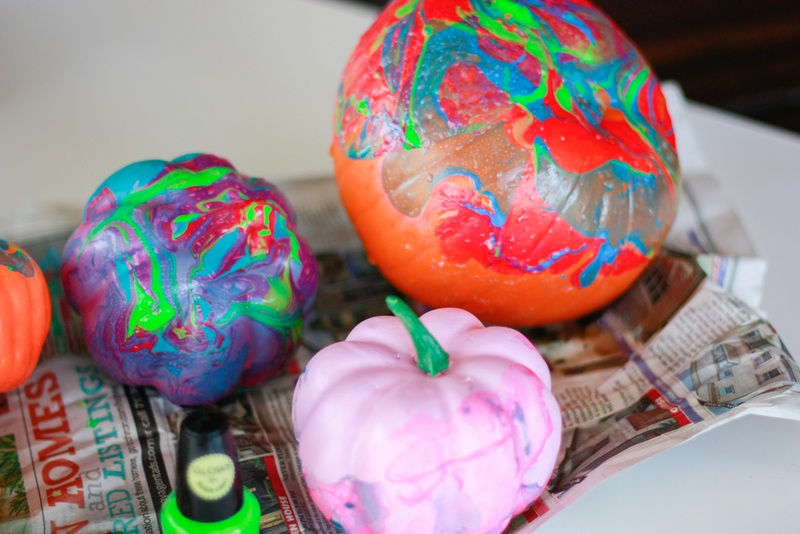 Nail polish pumpkins are an easy way to use of some of your old nail polish stash and create cool, custom pumpkins! I don”t really like painting my nails. I’ve never been very good at it – my left hand will look perfect but my right hand looks like a toddler painted it. Despite that, I have a pretty significant amount of nail polish hanging out in my bathroom. There are a lot of pinks and reds in there, but I have pretty much every color imaginable. 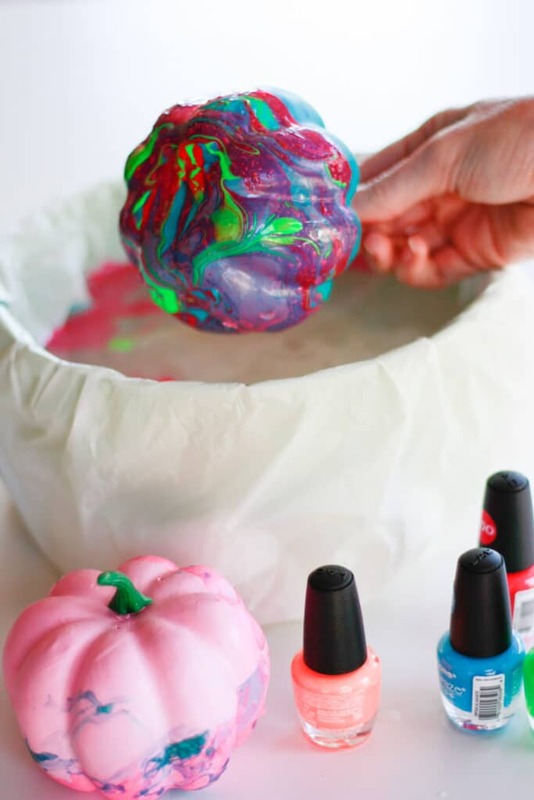 When I was brainstorming pumpkin decorating ideas, I remembered a technique I’d seen with nail polish. Since the polish will float on the surface of water, you can actually dip items in the water and pick up the polish to create a cool watercolor looking technique. 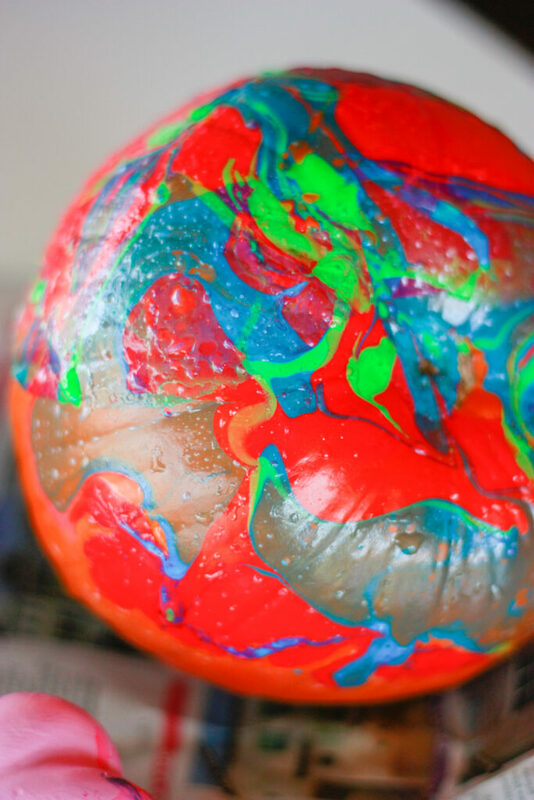 I’d seen this done on coffee mugs and knew it would look great on pumpkins as well! I created these nail polish pumpkins with some old nail polish and I tried it on painted and unpainted pumpkins as well as on real and fake ones. STEP 1: Fill the bowl with water. The bowl should be large enough to submerge your pumpkin! If you are using a larger pumpkin you will probably need a pretty big bowl! You could also use a storage tub or a bucket. 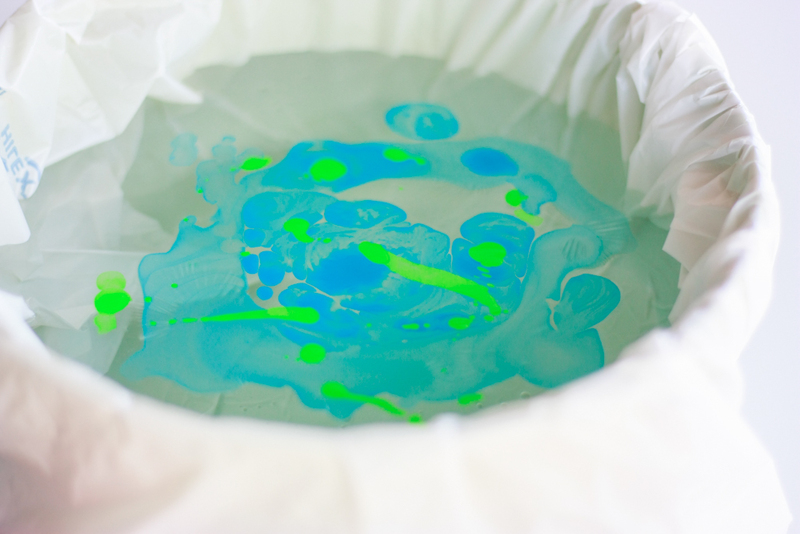 STEP 2: Pour nail polish onto the surface of the water. I found I had to move kind of quickly because the polish starts to harden pretty quickly. If you are using more than one color, you may need to use a toothpick to gently swirl the polish around. 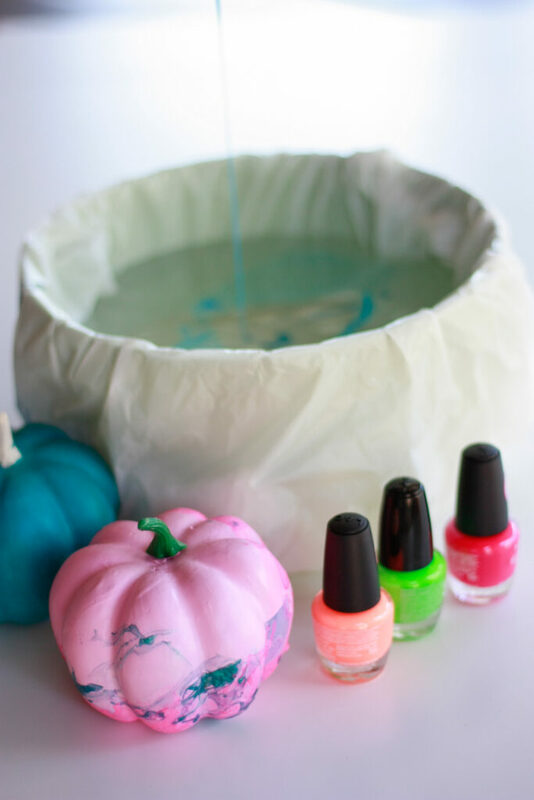 STEP 3: Dip your pumpkin into the water, and roll through the nail polish. You’ll see how the pumpkin will actually pick up the polish straight off the surface of the water – that’s why you want to roll through it! 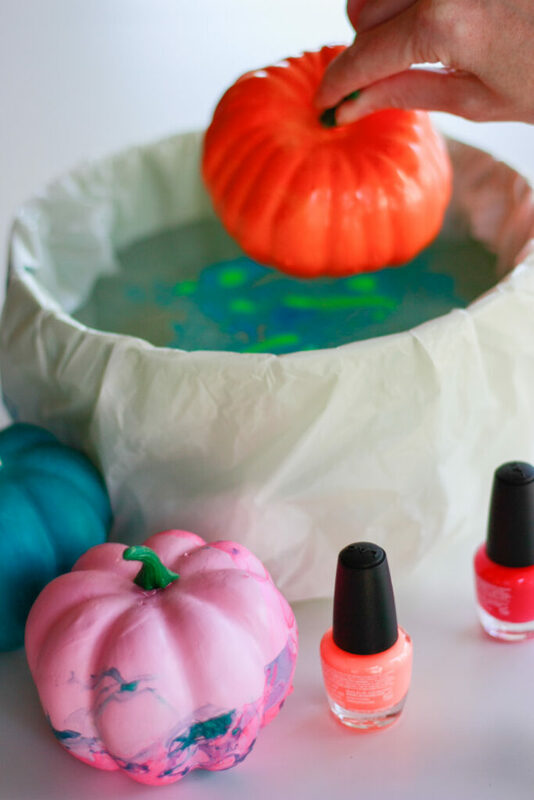 You may need to add more nail polish to the surface of the water and put the pumpkin through a second time. I had to do this on my slightly larger pumpkin! I used several different colors on my nail polish pumpkins, and I was most excited for the glow nail polish! I can’t wait to see what it looks like at night!